'Mary Poppins' runs Friday–Sunday through May 24 at Spreckels Performing Arts Center. 5409 Snyder St., Rohnert Park. Times vary. $22–$26. 707.588.3400. 'Crazy for You' runs Thursday–Sunday through May 31 at 6th Street Playhouse. 52 W. Sixth St., Santa Rosa. Times vary. $15–$37. 707.523.4185. 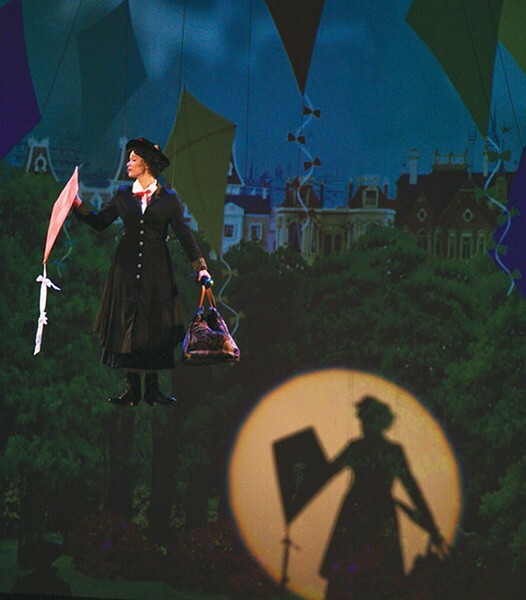 UP WHERE THE AIR IS CLEAR Heather Buck plays a spot-on Mary Poppins in Spreckels' production. Transforming one of the best-loved stories of all time into a stage musical takes guts, creativity and a bit of daring-do. In adapting Walt Disney's indelible Mary Poppins, writer Julian Fellowes (Downton Abbey) pulls it off, rewriting the plot to make it more faithful to the books by P. L. Travers, while retaining most of the movie's songs and several of its best moments. In the splendid new production by Spreckels Theater Co., Mary still flies (spectacularly), and she shows more edge and power than in the film. Under the direction of Gene Abravaya, the entire show is packed with wonder and emotion. The unruly siblings Jane and Michael Banks are causing friction between their parents, the skittish but blustery Mr. Banks (Garet Waterhouse) and the strong-willed Mrs. Banks (Sandy Riccardi, wonderful). Right on cue, the mysterious Mary Poppins (Heather Buck, spot-on) arrives with a bag full of tricks and a plan to put things right, with the amiable assistance of best friend Bert (Dominic Williams). In a dark-humored subplot, the terrifying Miss Andrews (a stellar Mary Gannon Graham) appears to battle Mary Poppins for the household's future, and perhaps a bit of its soul. The effects are cleverly done, the dancing and music are eye-popping and ear-pleasing, and the bittersweet ending is effectively lovely. True to form, Mary Poppins brings out the best in everyone involved. Meanwhile, at 6th Street Playhouse, the Lemons-into-Lemonade Award of the month goes to director Craig Miller, who has cleverly surmounted a number of imposing challenges in creating a highly entertaining new production of the 1992 musical Crazy for You. The Tony-winning show by Ken Ludwig is built from Gershwin standards, with a plot involving a dusty Western town invaded by show people from New York. Miller's original opening scene sets things up and solves an array of issues, including a cast with far more women than men. His solution is not just clever; it makes the show funnier. With spectacular choreography by lead actor Joseph Favalora and a winning performance by Abbey Lee as a love-struck cowgirl, Crazy for You is not exactly deep, but it's funny, sweet and driven by an infectious love of the theater.